11:19 out for 0 - gave it all the chance I could, but controlled my loss; loss is all you do control. more staying power at the expense of ultimate profit. 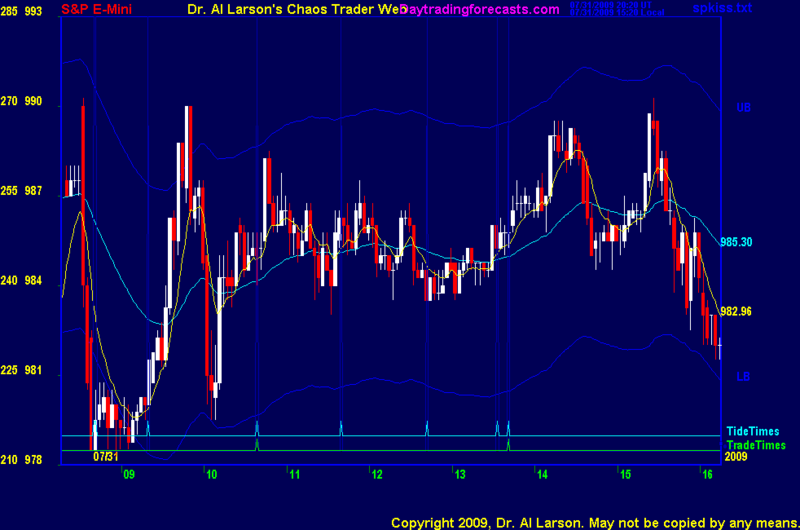 10:35 I have placed a Fractal Grid (From CTME) chart in the Certified Chaos Trader's Room. It is open to graduates of my 4 main courses. for a small gain, and hold the other half for max. What this does for you is smooth your equity curve. It increases your winning percentage as well. On occassion you loose maximum on both, which is the downside. Some traders trade three sets of contracts, taking a small gain on 1/3, a medium gain on 2/3, and letting 1/3 run. 7/31/2009 1:34:01 PM MT DP****:: Me too. Done for the day. Have a great weekend everyone. 7/31/2009 12:54:50 PM MT DP****:: Yep, sure did. One of my basic trading windows has ES, TF (RUT), and NQ (Nasdaq). Conventional wisdom says that TF is the leader. So when I see divergence between it and the others I look for entry based on TF strength or weakness. 7/31/2009 12:43:42 PM MT DP****:: Guess I jinxed it. 7/31/2009 12:29:35 PM MT DP****:: New highs being set in the RUT; this is good for longs. 7/31/2009 10:08:33 AM MT TG****:: Hi Al, posted question in CCT chat room. 7/31/2009 8:13:18 AM MT TG****:: seemed like 7 moves down from yesterday's high to today's preoutcry low, and fit a 6 hour FOP reasonably well at times though definitely not standard. Low pivot came at first of two moon timelines. 7/31/2009 7:41:42 AM MT DP****:: Al, if you have time could you share your guidelines for position size / management? I always learn from your insight and experience. Thanks for all you do here. 7/31/2009 7:39:35 AM MT DP****:: Good morning all. Dr. Al offers the most consistent predictive products I've seen in 15 years of investing. Welcome to the big show.